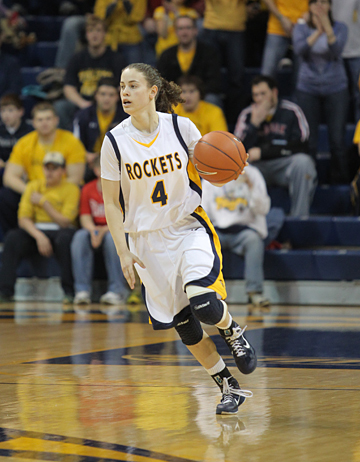 Senior Naama Shafir was a 2011-12 MAC Player of the Year candidate before she sustained the knee injury. Senior Naama Shafir has been lost for the remainder of the 2011-12 season after suffering a torn anterior cruciate ligament (ACL) in her right knee, Head Women’s Basketball Coach Tricia Cullop announced Tuesday. Shafir is expected to have surgery to repair the ligament by the end of December. The 2011-12 Mid-American Conference Player of the Year candidate was injured in the first minute of play during UT’s 69-58 win at Indiana Nov. 25 while driving to the basket and distributing a pass to a teammate. Shafir tried to return to the game later in the first half, but the three-time All-MAC honoree was unable to put any significant weight on her injured knee. Shafir, who had started 106 consecutive games before sitting out in Toledo’s loss at Arkansas State Nov. 27 was averaging 9.3 points, a squad-best 3.5 assists, 2.3 steals and 1.5 rebounds in 25.0 minutes per game this season. She ranks sixth in the MAC in assist/turnover ratio (1.3), seventh in free-throw percentage (85.0 percent, 17 of 20), tied for seventh in assists and 22nd in scoring. A season ago, she averaged a team-high 15.3 points, a squad-best 5.1 assists, 3.4 rebounds and 1.3 steals in 30.8 minutes per game. She finished third in the MAC in assists (34th in NCAA), seventh in assist/turnover ratio (1.09) and 10th in scoring en route to earning first-team all-league honors. The native of Hoshaya, Israel, was a key component in the Rockets capturing the 2011 WNIT and claimed tourney MVP recognition after scoring a career-high 40 points in a thrilling 76-68 victory over USC in the championship game April 2 in Savage Arena. Shafir sits fourth in UT annals in assists (569), fifth in free throws made (441), eighth in scoring average (13.7 points per game) and free-throw percentage (76.8 percent, 441 of 574), ninth in steals (168), and 10th in points (1,452). “I hope to see a sense of urgency,” said Dr. Rubin Patterson of the 2011 United Nations Framework Convention on Climate Change. The director of the Africana Studies Program and professor and chair of the Department of Sociology and Anthropology will be well-placed to gauge the mood, given his role as a sponsored participant in the annual event, held this year in Durban, South Africa. 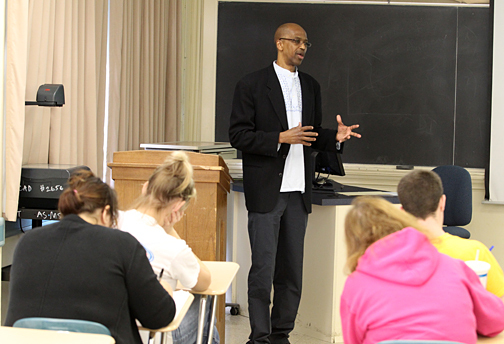 Dr. Rubin Patterson is teaching Social Development in Third-World Nations this semester at The University of Toledo and said students are surprised to learn that half of U.S. exports go to that part of the globe. Patterson, who’s being sponsored by the African Union on the strength of his long involvement with its economic development wing, New Partnership for Africa’s Development (NEPAD), can share plenty of economically based reasons for urgency. The first Earth Summit in 1992, Patterson continued, was convened because world leaders recognized that the then-poor countries of the Global South (that is, Third World) were going to become, collectively speaking, major economic players. “We’re seeing it now, with China, Brazil, India and southern Africa,” he added. As well, he hopes that the convention, which starts Nov. 28 and runs through Dec. 9, will open possibilities between African nations and The University of Toledo. “As we know,” he said, “UT is already doing a good job of creating renewable energy university-industry collaborations between. Since NEPAD’s goals intersect with ours, I’ll be exploring options.” Student recruitment from emerging nations is one such opportunity that he noted; new alliances with a broadly based sustainability sector was another. For his part, Patterson will be taking part in collective discussions and interviews of government officials and technocrats in ministries of energy and environment. He’ll also interact with grass-roots community-based organizations, social movement organizations and social entrepreneurs associated with issues of sustainability. Some of what he learns will appear in his forthcoming book, Greening Africana Studies, slated to be published by Temple University Press in 2012. His experiences also will help define the content of his spring 2012 course, Environmental Inequalities and Opportunities. The UT College of Innovative Learning will host a discussion on the human dimension of the global climate change issue. Dr. Andy Jorgensen, UT associate professor of chemistry and director of general chemistry, will give the lecture titled “Global Climate Change: What Is It? How Will It Affect Us? Can We Reduce the Impact by Our Actions?” at 3:30 p.m. Thursday, Dec. 1, in Wolfe Hall Room 1205. Jorgensen will present background information about climate change and methods used to characterize the changes. The discussion also will include possible consequences of different scenarios as well as possible solutions. “We will talk about the facts of climate change and what we can do to address it,” Jorgensen said. Much of the presentation is based on work Jorgensen did on sabbatical in 2008 and 2009 as a Senior Fellow with the National Council for Science and the Environment. 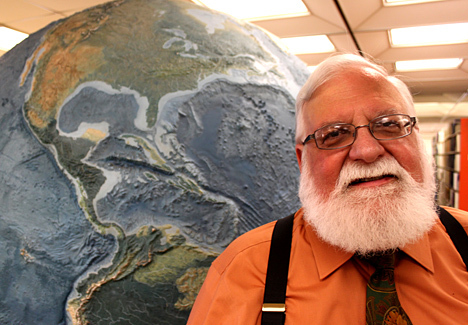 His current research related to climate change is supported by NASA and the National Science Foundation. Participants will be invited to join the discussion and present their own suggestions on possible ways to respond to global climate change. Those who have personal response devices known as “clickers” are encouraged to bring them to make their experience even more interactive. Additional clickers will be provided at the free, public event. Learning from history is one effective way to avoid repeating it, and a group of scholars are doing their part to spread knowledge about massacres of the late 18th century. Four scholars who comprise “The Massacre Project,” a collaboration dealing with historical massacres around the world, will present their research at the 2011 Honors Affiliate Symposium: “Massacres Worldwide, 1780-1820” at 6:30 p.m. Thursday, Dec. 1, in the Driscoll Alumni Center Schmakel Room. • Dr. Lyndall Ryan, honorary professor of history at the University of Newcastle, Australia. The focus of their panel will be the British and U.S. treatment of Native Americans, the massacre of soldiers and civilians during the Napoleonic wars, and the British colonial impact on Australian Aborigines and the indigenous people of South Africa. The symposium is sponsored by the UT Honors College, the Honors College Alumni Affiliate and the UT Chapter of Phi Kappa Phi. The event is free, but reservations are requested. To RSVP and for more information, visit utoledoalumni.org or call 419.530.2586. 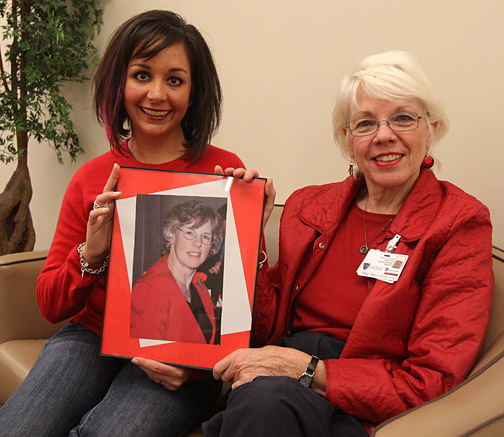 Danielle Van Fleet, left, and Sue Carter hold a photo of Ann Locher, who founded the University’s Ryan White Program in 2000. Danielle Van Fleet often thinks of Ann Locher. When her running shoes strike the pavement, she thinks of Locher’s tireless efforts on behalf of those with the human immunodeficiency virus (HIV). As she keeps pace in the rain, faces from UT’s Ryan White Program cross her vision. And when Van Fleet designed a T-shirt for her next race, a half marathon in Las Vegas Dec. 4, Locher’s dedication somehow seeped into the art. Locher, a clinical nurse specialist, educator and advocate, passed away unexpectedly in June 2010. UT’s Ryan White Program, which Locher founded in 2000, is a legacy of her dedication to serving those with HIV and acquired immune deficiency syndrome (AIDS) for most of her professional life. Van Fleet is one of Locher’s foot soldiers, volunteering with the Ryan White Program for five years. She administers tests, educates and counsels those who probably would go without proper medical care if the program didn’t exist. This is the back of the T-shirt Danielle Van Fleet designed for her Dec. 4 run. She said she will honor Locher, as well as the approximately 750 people served in UT’s program, with each stride of the 13.1-mile race, and would like to raise at least $1,000 in Locher’s memory. “The money I raise will go directly to UT’s HIV clinic and will be used to ensure our clients receive the life-sustaining medication and other help they need,” Van Fleet said. Those interested in giving through Van Fleet’s run may go to give2ut.utoledo.edu and direct their donation in memory of Ann Wayson Locher. Additional information is available on Facebook at http://on.fb.me/runforhiv. Sue Carter, social worker and clinical counselor in the Ryan White Program, said Locher will be in her thoughts during Van Fleet’s race, as well. The night before, Carter will represent the Ryan White Program at a fundraiser, continuing Locher’s work. Carter has worked in the Ryan White Program during her entire 20-year career at UT. She recalled her first encounter with Locher, who founded the first grant-funded HIV clinic in northwest Ohio before coordinating UT’s program for 10 years. Shortly before her death, Locher had been preparing the Ryan White team for her future retirement, focusing on particular gaps that would need to be filled, Carter said. “After Ann died, as we floundered in our grief, we just filled those holes faster than we’d planned,” she said with a fleeting smile. Since Locher’s death, the Ryan White Program has added seven testing sites to its original two on UT’s Health Science and Main campuses. New sites are at the Lucas County Department of Job & Family Services, Migrant Farm Laborers campsite, Owens Community College, Perrysburg Community Care Center, Adolescent Medical Clinic, Center for Choice and the Corrections Center of Northwest Ohio. “The Ryan White Program was Ann’s baby, but she brought us all along with it,” Carter said. “Everything here is her dream come true. Our team now includes pharmacists, therapists and nurse practitioners, and we have a great package of care that keeps our patients as healthy as possible. 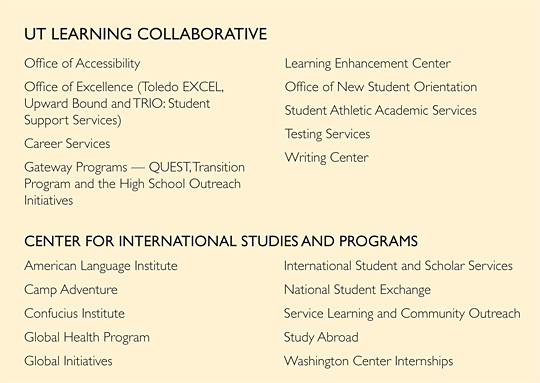 The University of Toledo Learning Collaborative has worked to support and enhance the academic journey of all UT students for the past three years. With new direction and focus areas on which to concentrate, Angela Paprocki has been named the executive director of the UT Learning Collaborative, and Dr. Sam Spann has been named the executive director of the new Center for International Studies and Programs. Margaret Traband, vice provost for undergraduate studies and special assistant to the provost, and former UT Learning Collaborative executive director, said the goal of creating the Center for International Studies and Programs is to provide more of a focus area for UT’s student support services and international experiences. “Angela Paprocki is a good fit to lead the UT Learning Collaborative with her experience as director of the Office of Accessibility. She understands the needs of UT students and will take the UT Learning Collaborative in the right direction,” Traband said. “Dr. Spann has extensive experience with international programs, as director of the UT Learning Collaborative’s Office of Academic Engagement. He understands the importance of an international experience and will help UT students build their global competencies,” Traband said. The UT Learning Collaborative now houses the Office of Accessibility, Learning Enhancement Center, Writing Center, Career Services, Testing Services, Student Athletic Academic Services, Office of New Student Orientation, Gateway Programs and the Office of Excellence. “I look forward to bringing new innovative ideas and creating stronger partnerships among UT Learning Collaborative programs and offices and with the UT community,” Paprocki said. The Center for International Studies and Programs houses the Confucius Institute, Global Health, Global Initiatives, International Student and Scholar Services, American Language Institute, and the student experiences programs that were housed in the Office of Academic Engagement — Study Abroad, Camp Adventure, Service Learning and Community Outreach, National Student Exchange, and Washington Center Internships. The UT Learning Collaborative administrative office will be relocating to University Hall near the end of the fall semester, and the Center for International Studies and Programs will be located in the Snyder Memorial Building after renovations are complete. UT:10 News, the student-run television news broadcasting class at The University of Toledo, was recognized for a best broadcast in the nation at the College Broadcasters Awards. UT:10 News received first place in the “Best Special Broadcast” category for the April 5 segment, “UT Myths and Legends,” about the urban legends on campus such as the origins of Centennial Mall. 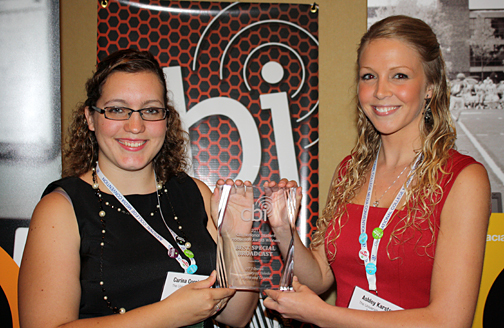 Ashley Karsten and Carina Cornieles, UT:10 News student producers, attended the College Broadcasters Inc. National Student Media Convention Oct. 29 in Orlando, Fla., to receive the award. UT:10 beat out three finalists from Rowan University in Glassboro, N.J., St. Cloud State University in Minnesota and the University of North Carolina at Chapel Hill. The College Broadcasters Inc. is an organization that includes members from U.S. collegiate radio, television, webcasting and other media programs. TV Journalism is a class offered in the Department of Communication that combines five subject areas taught in separate classes in other broadcasting programs. Students produce their first UT:10 newscast by the fifth week of class. The winning “UT Myths and Legends” segment was anchored by Karsten and Ashley Roth, then a senior majoring in communication; Roth graduated and now works for 13 ABC Toledo News. John Eidemiller, UT media producer and director, served as a staff adviser for the segment. The winners of the second annual University of Toledo Innovation Enterprises Challenge Business Plan Competition were announced Thursday at the Entrepreneurial and Business Excellence Hall of Fame Awards at the Pinnacle in Maumee. “We congratulate all 18 entrants for the extremely high-quality proposals they submitted,” said Richard Stansley Jr., chair of UT Innovation Enterprises. “These technologically innovative ideas clearly demonstrate creative thinking within the UT campus, which is exactly what this competition strives to foster. “We are pleased to see this competition become a critical step in developing an innovation system that includes the proper infrastructure and business tools to foster the creation of legitimate new products and services,” he said. “We believe the winning carefully constructed business plans in this year’s competition form a solid foundation on which these entrepreneurs can build successful businesses,” said Dr. Sonny Ariss, UT professor and chair of the Management Department. “We thank the judges who spent many hours reviewing the plans; they are Richard Stansley Jr., Daniel Slifko, Dennis Johnson, Scott Buehrer, Richard Heltzel and Richard Anderson. • First place, $10,000 prize: Sunnyfuels LLC by Dr. Mahabala Adiga, laboratory research assistant in the Physics Department. The products that Sunnyfuels will manufacture will be cost-effective, energy-efficient PEM/membrane electrolyzers for cheaper hydrogen production from solar, wind or other power sources, and low-cost, lightweight, portable hydrogen compressors to condense hydrogen for small fuel cell generators. • Second place, $5,000 prize: Expandable intervertebral cage by Dr. Mohammad Elahinia, UT associate professor of mechanical, industrial and manufacturing engineering. The expandable intervertebral cage will be made from a shape memory alloy (nitinol) to correct spinal injuries and provide a smaller surgical footprint, leading to a faster recovery period. • Third place, $2,500: Nanospection by Christopher M. Hessler, UT graduate assistant in the Department of Chemical Engineering. The products that Nanospection will develop are cost-effective nano gold- or silver-coated slides that have a number of potential applications such as optical sensing, environmental monitoring and chemical detection. • Swankr.com, Dane Theisen, UT alumnus. Entries for the second Innovation Enterprises Challenge Business Plan Competition were due in October. Finalists made oral presentations about their businesses to a panel of judges Nov. 3. As in last year’s competition, prize money was awarded to established business entities, not to the individuals. The University of Toledo Medical Center’s patient satisfaction efforts were highlighted last week in a New York Times story discussing how hospitals nationwide increasingly are expected to provide outstanding customer service in addition to great health care. More than 2,000 UTMC employees have been through iCARE training to help master soft skills like communication, active listening, personal stress management and empathy. Dr. Scott Scarborough, senior vice president and executive director of UTMC, said the hospital is benefitting from the leadership position it is taking in implementing changes to enhance the patient experience. Starting in 2012, new Medicare rules will include patient satisfaction in the formula to determine how much hospitals are paid for the care they provide. Dr. Jeffrey P. Gold, chancellor, executive vice president for biosciences and health affairs, and dean of the College of Medicine and Life Sciences, said that as the health-care industry evolves, academic medical centers increasingly will be asked to provide leadership to navigate those changes. The UT Medical Center operational leadership team posed for a photo last week at its meeting to celebrate an outstanding Joint Commission accreditation visit. Hospital leaders said the collective efforts of all UTMC employees led to one of the best site visits Joint Commission surveyors said they have ever seen. The University of Toledo community is invited to come together to remember Dr. Alice Skeens Friday, Nov. 18, at 11 a.m. in Doermann Theater. The dean of the College of Languages, Literature and Social Sciences died Nov. 12 at age 75. As part of the memorial service, friends, colleagues, students and alumni are encouraged to share thoughts on the longtime administrator and associate professor to universitynews@utoledo.edu with the subject line “Alice Skeens.” These messages will be included in a presentation and will need to be one or two sentences long to fit on the screen. Submissions are requested by noon Thursday, Nov. 17. A native of Lovern, W.Va., Skeens came to Toledo in 1960 through a National Defense Scholarship Program and was a teaching assistant for three summers before becoming a full-time instructor in the former University Community and Technical College. Four years later, she moved to the College of Arts and Sciences as an assistant professor and undergraduate adviser. Skeens served as assistant dean and associate dean for student affairs in the College of Arts and Sciences. In 1982, she was promoted to associate professor and later served as assistant to the president from 1987 to 1997. She didn’t desert administration entirely, serving as interim associate dean of the College of Arts and Sciences from 2008 to 2009, and was named associate dean in 2010. When the college was divided later that year, she was tapped as a founding dean. Active in Faculty Senate, she became its first woman chair in 1982, and was elected to a second term in 2003. As well, she served on the organization’s board. Her participation in the University Women’s Commission stretched back to the organization’s early days at UT in the 1970s. Women’s issues, especially in the early days of a growing national consciousness, were close to her heart, and in the 1970s she was faculty adviser for the UT chapter of Alpha Lambda Delta, a national scholastic honor society for freshmen women. Her extensive service at UT — she once noted that she may have served on every standing committee at the University — also included Graduate Council, the President’s Commission on Student-Centeredness, and the NCAA Self-Study Steering Committee. The Catharine S. Eberly Center for Women named Skeens its Woman of the Year in 1994; in 2005, she received the UT Outstanding Adviser Award. 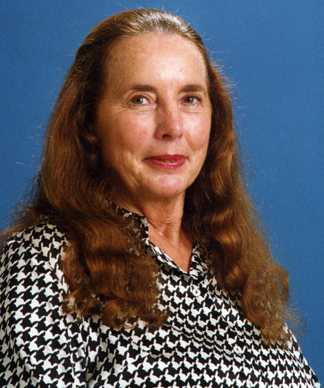 She earned her doctorate in guidance and counselor education from UT in 1972, in addition to a master’s degree from West Virginia University and a bachelor’s degree from Concord College. She was a member of the Presidents Club and the UT Alumni Association. Skeens was preceded in death by her husband, Franklin Skeens; sisters, Crystal Frazier, Mabel White and Edith Hypes; and brothers, Jo, Charlie, Carlyle and Marvin Thorne. Surviving is her son, Charlie (Cindy) Skeens; grandchildren, Kirsten, Molli, Jenna and Josh Skeens; sister, Elaine; and many loving nieces, nephews and cousins. Calling hours will take place Thursday, Nov. 17, from 2 to 8 p.m. at Bersticker-Scott Funeral Home, 3453 Heatherdowns Blvd. View and sign Skeens’ condolence page at berstickerscottfuneralhome.com. The family suggests memorials to the UT Athletic Department, the Alice Skeens Scholarship Fund at the UT Foundation or the Quota Club.